U.S. Education Secretary Betsy DeVos on Tuesday again held up the story of a student who graduated from East Hartford High School to push her case for school choice. East Hartford, however, actually has seen a substantial expansion of school choice options since Michael graduated 17 years ago. DeVos said Michael told her that he had gotten a diploma but not an education at East Hartford High School. In 2000, when Michael graduated, few residents from East Hartford attended schools of choice such as magnet and charter schools. 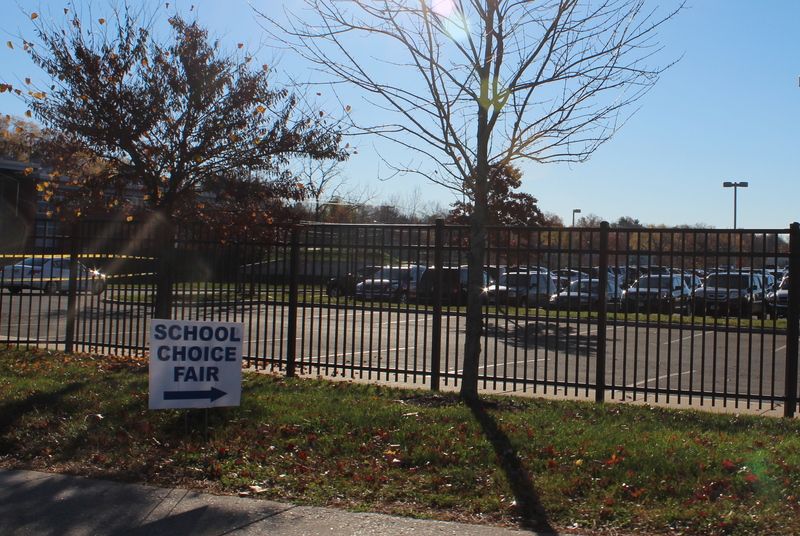 But today – in 2017 – a sizable share of East Hartford nearly 8,000 school-aged residents attend schools they enrolled in through a choice lottery. More than 1,100 East Hartford residents leave the district-run schools to attend a regional magnet school – that’s one-in-seven students. And then there are the hundreds of city residents who attend Connecticut International Baccalaureate Academy, a magnet school run by East Hartford that students also enroll in through a lottery. When Democrat politicians, teachers and union officials rallied at East Hartford High School last week to dispute DeVos’s earlier testimony about Michael before the house budget-writing committee, the IB Academy magnet school was pointed to as evidence the district offers a quality education. 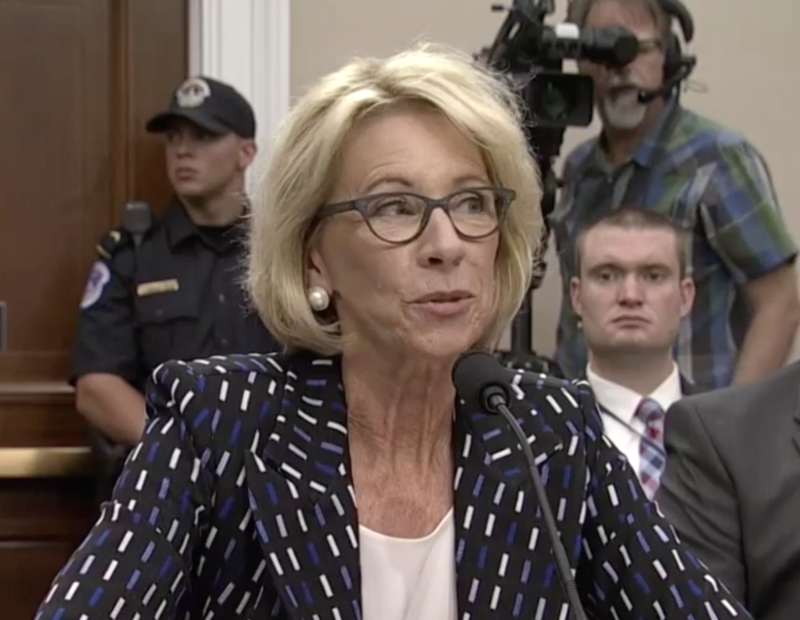 DeVos’s testimony sparked a familiar argument between those who favor school choice as a primary way to improve schools and those who decry cuts to traditional public schools as a big part of the problem. DeVos and President Trump want districts to push forward with school choice, and the Republican president has proposed a new $1 billion competitive grant called FOCUS – Furthering Options for Children to Unlock Success – that they hope will spur expansion of school choice options across the U.S. But the administration’s budget also drastically cuts other education grants, or eliminates them. Traditional public schools also say diverting resources to increase choice comes at the price of leaving many students behind in struggling neighborhood schools. “We don’t want to be the district left behind,” Nathan Quesnel, the East Hartford superintendent told a Superior Court judge during a school-funding trial last spring. He said Michael’s story is not a reason to strip resources from a districts like East Hartford. “Rather than divest in districts like East Hartford we should invest. These are challenges that can be overcome,” he said. Students throughout Connecticut have lots of choices for which school to attend. One in eight students this school year attend a magnet, charter, vocational or other school of choice. But thousands of students remain in struggling, low-performing schools. The availability of school choice options can largely be attributed to the state’s Supreme Court, which ordered the legislature in 1996 to eliminate the inequalities created by segregation of Hartford’s black and Hispanic students. The order spurred creation of more than 40 new magnet schools as the state’s chief strategy to get suburban, white students to attend school with city students. “It’s not like we are a choice-negligent region,” said Casey Cobb, of the University of Connecticut’s Neag School of Education who has studied school choice models across the country, including in Connecticut, Florida and Milwaukee. Cobb said research overwhelmingly shows that wide-open school choice models like those in Florida and Milwaukee that use vouchers to allow parents to choose which school their children attend haven’t demonstrated improved outcomes. “It sounds like a perfect system, but in reality it tends not to be,” he said. A more controlled school-choice model – like the magnet school system used in the Hartford region – has proven effective in improving outcomes, he said.